Going skydiving promises to be one of the most memorable experiences of your life. More people than ever are discovering for themselves the wonders and complete joy that freedom of the skies can bring. For thrill seekers everywhere, skydiving has become a highly sought-after activity; it’s hard to beat the adrenaline rush of a parachute jump! 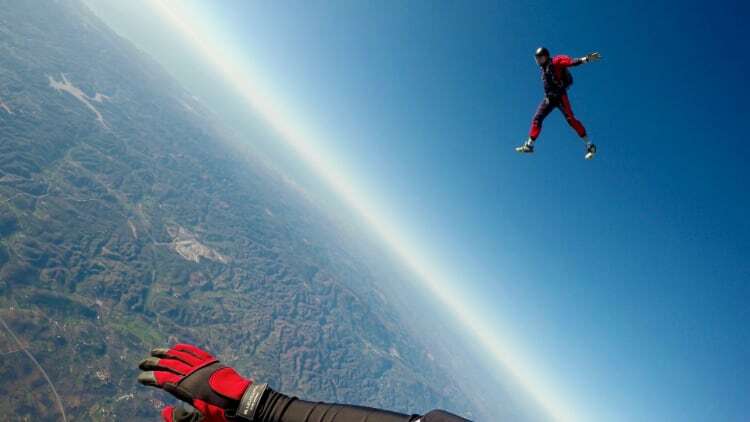 When it comes to getting your heart going, you can’t go wrong with a skydive; nothing compares to watching the world unfold from thousands of feet up in the air. Everyone knows the risks associated with skydiving, but few are aware that it’s one of the safest extreme sports out there. Due to the high-speed, aerial nature of this activity, skydiving centres throughout the world do all they can to keep people out of harm’s way; however, even with the best of intentions, accidents can happen. We highly recommend that you take out the right travel insurance before you go skydiving overseas. Our specialist skydiving cover can give you complete peace of mind, which is exactly what you need when you’re jumping out of a plane! What’s covered with our skydiving insurance? Whether it’s your first time or you’re a seasoned veteran of the sport, you can relax knowing you have cover on your skydiving trip abroad. Because skydiving cover is only available when you take out either our Gold or Diamond travel insurance, you can look forward to a more comprehensive range of benefits (such as increased limits for luggage and personal effects and higher levels of rental car insurance excess cover), as well as the usual perks – overseas medical and dental, 24/7 emergency assistance, and cover for disruptions to your trip to name a few. Each of our policies also includes a 14-day cooling off period if you need to cancel. Providing you’re not making a claim and aren’t cancelling your insurance after your trip has begun, you’ll get a full refund. What other sports and activities am I covered for? Well, someone fancies themselves as a daredevil, don’t they?! At Cover-More UK, we want to make sure you get the right travel insurance for your needs – which is why when it comes to covering your skydiving holiday, we’ve left nothing to chance. All our policies include cover for a wide range of sports and activities – including sailing (within territorial boundaries), bungee jumping and mountain biking – with even more high-octane pastimes covered under our Gold and Diamond plans. From hang gliding to hot air ballooning; abseiling to sea kayaking, our two most comprehensive insurance policies offer plenty for the avid adventurer to enjoy. Please remember, though: our travel insurance won’t cover you if you decide to participate in a professional capacity. How do I get a skydiving insurance quote? And that’s all there is to it. You’ll be putting on your parachute in no time!